Probably as long as I can remember I have been a keen admirer of pulchritude. So too were the pre-Raphaelites, but if their paintings are any indication, their concept of female beauty was, except in certain aspects, the product of their time. The 21st century man can still appreciate the skin tones of neck and decolletage, the luxurious hair and fullness of thighs pressing through draped fabrics of voluminous gowns depicted in colourful settings; the Cupid’s bow lips, the artificiality of posture and composition, less so. Well, we all know where beauty lies; and that it so often does. We know that it is ephemeral, but that it may be preserved in paintings, photographs and best of all in poignant images, ‘photo shopped’ by memory’ of past loves; obsessions that can almost amount to worship. Yes, folks, this is Old Bill talking. Has the fellow taken leave of his senses? All this is triggered by my recent forays into the world of the Pre-Raphaelites and their muses. It wasn’t just Sandys either. There are plenty of indications that others of the artists were prone to similar illusions. Take Burne-Jones for example: besotted by his Greek models, Mary Zambaco and her cousin Maria Stillman, his fascinations gave rise to masterpieces that produced waves of disapproval in Victorian society; besides, there was that explicit letter to him from Mary Zambaco, that his wife Georgie discovered in his pocket. Here Cupid modelled by Marie Spartali embraces Psyche (Mary Zambaco), rescuing her from the Stygian sleep to which Proserpine’s fiendish casket has condemned her. ‘The sexual ambivalence is both lovely and disturbing and must have been more so for Burne-Jones’ contemporaries ‘(Henrietta Garnett). That Ned Burne-Jones was well able to capture the likeness of his models must have produced a frisson of general disapproval. Victorian morality, remember. For me this picture summarizes Ned’s obsession. Nimue (Mary Zambaco) is voluptuous and Merlin’s hopeless expression perhaps mirrors the artist’c hopeless bewitchment. Resonating Stones: now available on Kindle as well as in print from this blog. Resonating Stones by Bill Macfarlane. The narrator, art critic for a Cypriot magazine, interviews an Irish sculptress who expresses the power of stone to store and re-transmit resonances of emotionally charged events. He sneers at this but, at the ensuing exhibition of the woman’s work, he and his partner experience unsettling effects. Soon after he is plunged into a serial nightmare about sinister events in his own past that he is obliged to record in the form of stories that become progressively more disturbing. These stories are linked by a thread that tells of growing obsession, and of a paranoia that threatens his sanity, and the safety of his partner. Originally published in paper back in 2000, Resonating Stones now appears under a new cover designed by Ngaio Macfarlane. 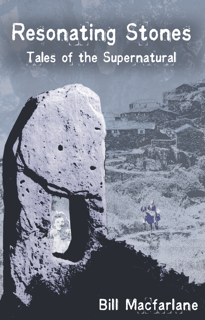 Resonating Stones is a collection of ghost stories, that mines the rich vein of Cyprus history and folk-lore. Places, such as the Venetian Bridges, the Royal Oak and the Brengaria at Prodromos exist, but the events are invention. Old Churches, caves dating back to antiquity, and especially the mysterious Tripimenes Petres (pierced monoliths) are authentic. You can still experience the tangibility of their ‘presence’ in the Cyprus countryside. These stories are not part of traditional Cyprus lore, though. For that, you must wait for the re-publication of Cyprus Land of Miracles by the same author, which is currently in progress. What follows was published a couple of times in the late 1990’s. The editors of both publications, expressed the hope that no-one would take it seriously. Suffice it to say that the Art of mixed-media scatterings is still alive and well in Cyprus. It can’t be denied that Cyprus has a litter problem, but how many of us appreciate how serious it is? Go to the summit of Kyparisha in the Limassol Forest. The views are stupendous but, apart from a few miserable shotgun cartridges, a beer can or two, and perhaps a cigarette packet, there is little trace of civilisation there. That is the crux of the problem. Just a short distance away from the beaten track, the improving processes of modern culture peter out and wild nature is allowed to take over. Admittedly, the more accessible places present no problem. The Phasoula road leading to the now-abandoned public tip is a good example. Along its length, a veritable art gallery of rubbish, litter, trash and coloured plastic greets the eye. Amazingly, some attractive items actually reached the tip itself in its heyday. Even here, a short journey on foot will soon take you beyond the range of human artifice, though the fragrance of the place spreads a little further. Defunct vehicles do not deteriorate fast in this climate, and they already form the bases of some impressive semi-permanent displays. Magnificent collages exist in all the cities, even round many villages, though it must be said that such ostentation only acts to accentuate the gap between town and the country. Overall, not nearly enough attention is given to old cars, discarded fridges, cookers, washing machines and the like. Even in prime sites such as the eucalyptus woods and cane fields round the Salt Lake, objects of this sort are being allowed to rot away in comparative obscurity. Is it beyond the imagination of Man to throw a touch of bright paint at them from time to time? This would not only enhance their effect, but extend their life span. Surely we all know that once these priceless objects are gone they will be lost forever. There must be some mileage to be gained from setting up awards for the most artistically challenging abandonments of this kind. On the whole, high places are singularly ignored, though some avant garde work is starting to appear on the very roof tops in the towns. Such sophistication is to be encouraged, perhaps by government grants. Sponsorship by local industry is in its infancy, though it has to be said, that areas adjacent to the industrial estate near Ypsonas show what can be done with just a little effort. To reach the more remote fastnesses of the island, hunters, who already contribute much, could be enlisted in a more organised way. It is worth considering that spent cartridges weigh much less than live ones. Since the time is approaching when there will be little left for them to shoot at, hunters might be allotted designated areas where they can blaze away to their hearts’ content. The empties could then be collected and taken, along with their often colourful boxes, to the nethermost parts of Cyprus. Dogs could easily be trained to carry small panniers, while those who love the traditions of the countryside might prefer to load up a couple of donkeys and, in that timeless Mediterranean way, bring colour and beauty to a drab countryside. These cartridges are very beautiful. They come in many colours and take years to deteriorate. We already know how well they look, strewn in profusion along the forest trails, but our aim must be to achieve a greater spread and to display them at their best. They could be arranged around rocks, festooned on bushes, or made into intricate mobiles hanging from high boughs. Floating exhibits might even be created on the ponds and reservoirs when water is present. When it is not, they would settle in unpredictable patterns, mirroring the random effects at work in the universe. The possibilities are endless. Already a great range of creative and imaginative work can be seen in a bewildering multiplicity of media. Broken glass, builders’ rubble, domestic appliances and crockery make up many of the more lasting displays. Other creations are touchingly short-lived, ephemeral as the butterflies that cavort in giddy pairs in the bondu. Magical miniatures in rotting vegetation, carrion from the butchers and hotel kitchens (alas too quickly eroded by the myriads of flies, microbes and rodents that abound) may be admired in many a secluded spot. Ultimately, one might imagine a technology that would equip every family car with computer-controlled garbage disposal facilities, designed to deposit wild fantasies of material on the verges of the motorway and lesser byways. By that time, a progressive authority will have suspended the collection of garbage. This, coupled with legislation obliging householders to dispose of their rubbish in an eye-catching way, will take us nearer to our goal. We stand at the threshold of a great social and cultural revolution. Let us built on what has already been achieved. The key to progress must be to bring about an even greater spread. Already, priceless objects lie interred beneath magnificent piles of rubbish. These must be exhumed and made available for all to enjoy. We cannot afford to waste our waste. Our philosophy must be to spread out litter thinly and visibly – otherwise, we will NEVER cover the whole of Cyprus. The Kindle version of the ‘Hunt for the Hassamboulia’ appears under a new cover designed by Ngaio Macfarlane. On it three of the gang appear on the faded copy of an old map of the Great Valleys of Western Cyprus: the ‘Wild West’ that the outlaws ranged over, ‘ free as birds’. The shadow cast by the taller of the three is the yatagan (knife) that appeared on the original cover. That yatagan was the weapon used in the murder that brought the younger brothers into the story. The map fades into a skyline of mountainous terrain that still exists today. This is the country that sheltered Dighenis (Col Grivas) in the late 1950s against all the best efforts of a modern army. Is it surprising that the recently arrived British should have had such difficulty in bringing the Hassamboulia to justice in the late 19C? 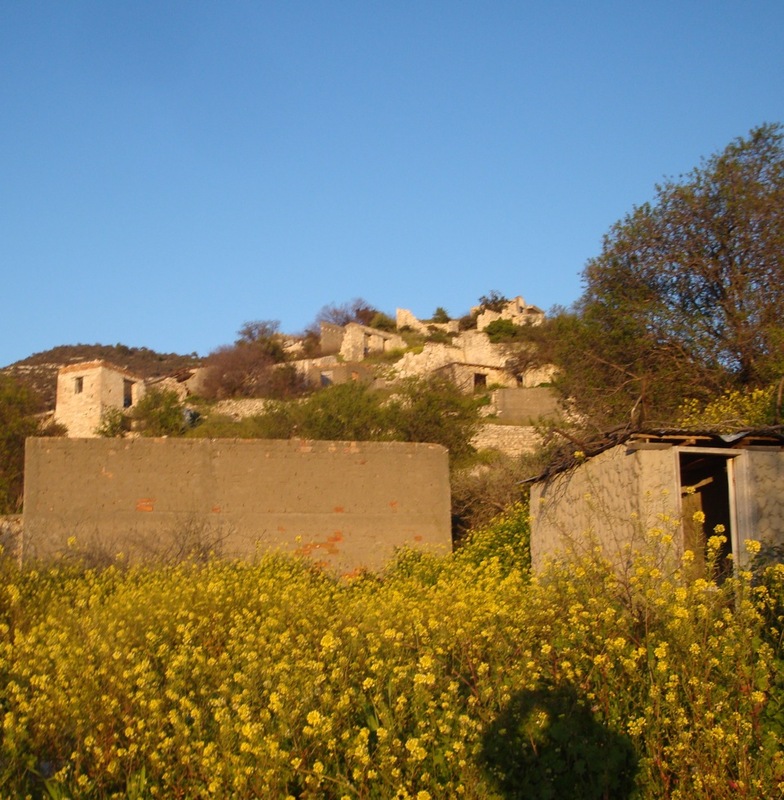 The Hassamboulia were Turkish Cypriots. Three brothers of contrasting character, fated to embark on a career of crime, over what should have been an insignificant local quarrel. Their exploits became progressively more and more outrageous, so that they became living legends. The story of the Hassamboulia still resonates in the folk lore of the region. When the print version of the book was published in 2007, copies sold like hot cakes, especially in Northern Cyprus. This version of their exploits is based on a police report from the 1930s, forty years after they were finally caught. Their crimes, form the backdrop to a fictionalized account of their career, their personalities, their relationships and motivations. As the new cover demonstrates, the geography still exists in which these legendary outlaws have been hunted down three times already: by the Brits, by the old policeman who wrote the 1930s report, and by the author. If you decide to join the Hunt for the Hassamboulia, the reward is to be enjoyed in savouring the places that echo with their history. Financial rewards? Sorry! The hundred pounds on offer for the Hassamboulia, was shared long ago between three informers. Grivas, with Stg 10,000 on his head, managed to evade capture in hiding, not in the mountains, but in Limassol. His EOKA organisation could not have survived, however, without their hideouts, some of which can still be visited in the mountains.